I got my cochlear implant from Med-El almost two years ago. I was a Peace Corps Volunteer in Malawi! – There is a picture of one of the recipients wearing his implant and the caption reads that he is “all smiles after the operation”. This is not possible because after the operation, your head is all swaddled like a mummy. And you don’t get “turned on” or rather, “activated”, until several weeks later. 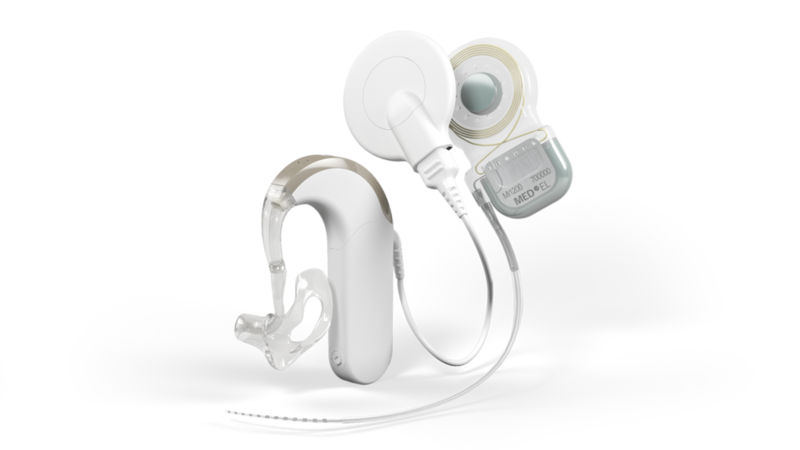 Components of a cochlear implant from the Med-El website. On the left is the processor that sits behind the ear. In the middle is the coil with a magnet inside it that rests on the head. On the right is the internal device (which also has a magnet in it to which the coil attaches to) which is surgically inserted underneath the scalp near the ear and is connected to an electrode array that is threaded through the cochlea. – I am concerned about whether or not the children will receive the necessary, consistent follow-up to help with speech and listening. It looks like both children live in a major city and can, hopefully, easily get to the clinic to receive services and equipment if needed. Because the children got implanted so late in their lives (at 16 and 9), it is not clear to me how successful they will be with the implant- it all depends on when they lost their hearing. If it was at birth, it will be very difficult for them to catch up, but because they are still young, there is hope. If they became deaf AFTER they acquired speech and language, then there is great potential for them to re-learn how to hear. The younger kids are implanted, the better the chance for success at speech and listening. – This article and other videos showing people getting their implants turned on seem to convey that the implant is a “cure-all” and once it is turned on, the person can suddenly hear. This is NOT the case. The person may hear a semblance of sound but they will almost never have an idea what kind of sound it is. I’m excited though, that this technology has found its way to Malawi, the warm heart of Africa! This entry was posted in Articles, Interesting Topics and tagged cochlear implant, Malawi, MED-EL. Bookmark the permalink. 1 Response to Cochlear Implants come to Malawi!